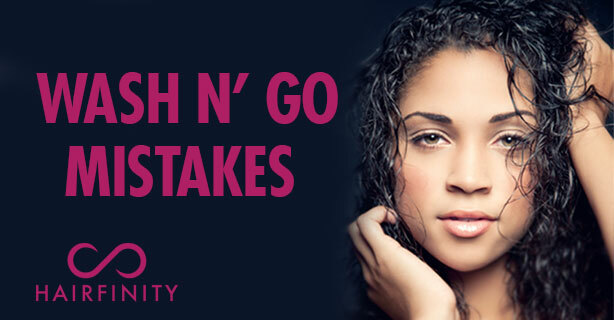 If you wonder why your wash n’ go attempts often end in less-than-perfect results, you may need to examine what you do to your hair before the final style. The products you use, along with how you handle your tresses, all contribute to whether your wash n’ go looks fabulous instead of frizzy or flat. Not detangling thoroughly: A great wash n’ go begins with the wash, even if you just conditioner wash. Detangling during this process is important. Well-detangled curls clump together well. Comb through while hair is covered in Essentious Hydrate Moisture Conditioner, as well as after rinsing. Improper products: To get good results, you must use the right products. This includes gels with some hold. Gels range from inexpensive to pricey; as you’ll discover when trying out various products, you don’t necessarily need an expensive gel to get a great wash n’ go. As for oils, avoid them; if you want a bit of added shine, you can add a touch of oil, but only to completely dry hair. Working in big sections: Once you have the perfect product, use it correctly by applying in small sections. This ensures even, complete coverage for the best results. Too much touching: After your products are distributed and you’re ready for your hair to dry, don’t mess up your curl pattern with extra touching. After your final comb-through on damp hair – stop combing, and you definitely don’t want to brush! Blow drying on high: Drying time can be lengthy for ladies with long and/or thick hair. While air drying is best, you may need to speed things along with a blow dryer. Just make sure you use one with a diffuser attachment, and don’t turn it on high. A low heat setting helps with drying time, but won’t disrupt your curls.